Westlake Village, located on the corner of Lake Shore Boulevard and Park Lawn Road, features 3 high-rise towers. 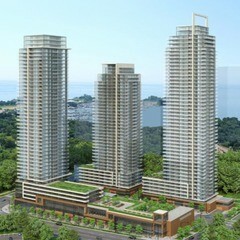 The 42 to 48-storey towers are situated on the Etobicoke waterfront, at the edge of Mimico Creek and adjacent to Humber Bay Park. This will be the area’s first true urban village.